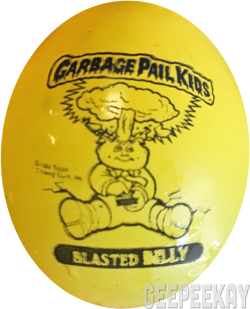 MADE BY: The Small Balloons were produced and released by Topps, Inc.
Topps released a series of balloons featuring various GPK characters. These balloons measured 7" around and came with 9 per package. 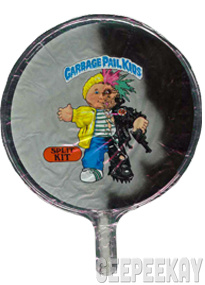 The balloons came in a variety of colors: Red, Orange, Pink, Green, Yellow and Blue and featured different Garbage Pail Kids characters on the balloons. 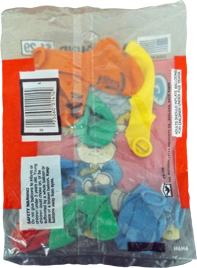 The characters on the 7" balloons were black ink only - no color. 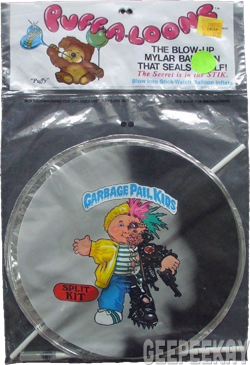 The 7" balloon packaging featured Adam Bomb on the front with a 'Red' background. 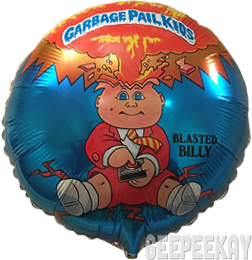 MADE BY: The Large Balloons were produced and released by Topps, Inc.
Topps released a series of balloons featuring various GPK characters. These balloons measured 14" around and came with 5 per package. 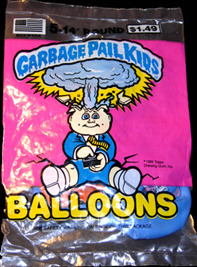 The balloons came in a variety of colors: Red, Orange, Pink, Yellow and Blue and featured different Garbage Pail Kids characters on the balloons. The characters on the 14" balloons were featured in color, as opposed to the B&W images on the 7" balloons. 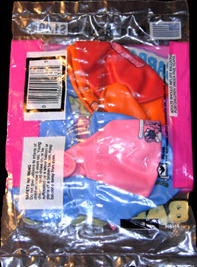 The 14" balloon packaging featured Adam Bomb on the front with a 'Original Series 1 Pink' background. 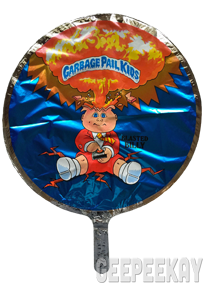 MADE BY: The Mylar Balloons were produced by M&D Balloons and released by Topps, Inc. 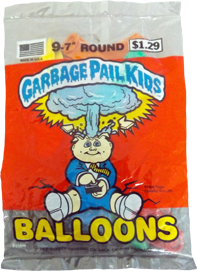 The mylar balloons from Topps (manufactured by M&D Balloons) are a rare and highly collectible piece of Garbage Pail Kids memorabilia. 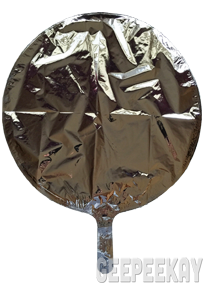 Unlike the standard rubber balloons which are easy to locate, the mylar balloons are becoming harder and harder to track down. 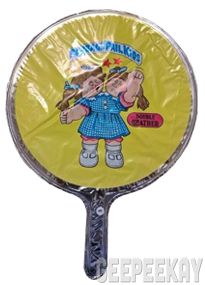 Commonly referred to as "Puff-A-Loons", these 9" balloons were packaged with a stick that was used to inflate the balloon and act as a handle to hold the balloon once inflated. 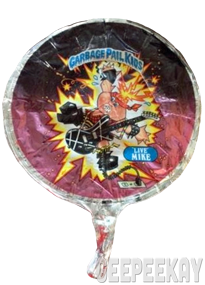 Over the years it has become more and more difficult to locate the mylar balloons in their original packaging, as most are now sold flat, without their straws/etc. 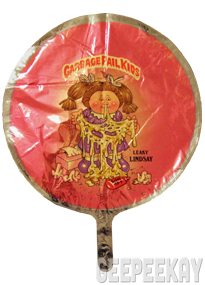 The standard packaging featured a colorful 'Puff-A-Loons' header with a separate bottom-section containing the balloon and straw. 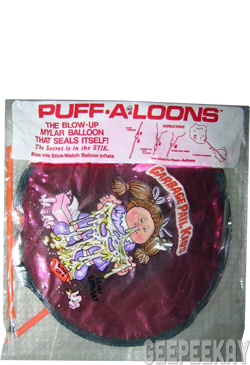 However, there is also a rare variation floating around that includes a more primitive package with the 'Puff-A-Loons' name and instructions printed directly on the bag. Also interesting to note is the fact this package contains orange straws, which were not typical for M&D balloons from the 80s.